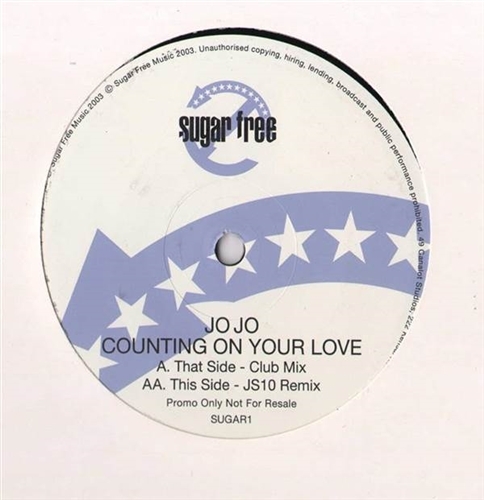 Jo Jo - Counting On Your Love 12"
TRANCE, Sugar Free, UK, 2003... Hard Trance with Counting On Your Love (Club Mix), Counting On Your Love (JS10 Remix). Guess Who! - Posse (I Need You On The Floor) 12" Unity 3 - The Age Of Love Suite 12" ATB Feat. York - The Fields Of Love 12" Groove Control - Zero Gravity 12"
Crescendo - Are You Out There 12" Butcher - Don't Let The Sun Go Down (Remixes) 12" Signal - Let Me In / Falling Away (Remix) / Down From Up 12" High Rise - My Home 12"